There are a lot of gardening books out there, and a lot of books on urban/suburban homesteading and on self-sufficiency. Many of them draw heavily from one another or from older books rather than from actual experience, but every now and then I come across a gardening book that I’m eager to share with others. 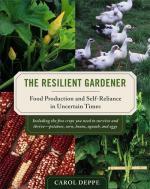 Carol Deppe’s new book, The Resilient Gardener, is clearly based on years (decades?) of personal hands-on experience and is a must-read for anyone interested in the issue of personal food security. It is not a general gardening how-to book. Ms. Deppe discusses the best ways to improve your own food security by producing your own staple crops, and what makes a staple suitable for home food production with no unusual harvesting, threshing, or milling equipment. This isn’t one of the obnoxious-survivalist manifestos about how to be a country and a law unto yourself. It’s a sensible discussion of how ordinary people can direct their efforts to make themselves better equipped to endure the hiccups that life throws at us, whether environmental or health-related. As I read it, I found myself thinking about the spreading problems in my native Louisiana after Hurricane Katrina devastated New Orleans. Nearby cities like Baton Rouge weren’t hard hit by the storm. But Baton Rouge would nearly double in size in a week as evacuees poured in, grocery stores there would be nearly emptied of staple foods and anything fresh, streets would be filled with excess traffic and often impassable, and water and sewer systems would be strained. People with prudent habits were better equipped to help themselves and others through a difficult time. No book about someone else’s needs and choices will ever be completely applicable to your own situation. Ms. Deppe includes a section on her own nutritional needs and decisions that can best be considered idiosyncratic. But then, as a doctor I believe that everyone’s needs are to a degree idiosyncratic, i.e. unique to themselves. Some basics apply to nearly everyone, but there’s a lot of individual variation. Her choices may have no applicability to you or me. They are, however, an encouragement to think carefully about our own needs and start doing more of what works for us. I have no desire to be completely food-independent, even if such a thing were possible. But I do get great pleasure from contemplating the winter squash, potatoes, and sweet potatoes that came out of my own soil and will help feed me through the winter, and on winter evenings by the stove I’ll be studying Ms. Deppe’s ideas and planning how to be a more prudent member of my community next year. the value of common sense among other things. Ms. Madison, it’s an honor to have you visit my site! Ms. Deppe’s book showed up in several later blogposts on my site after the initial book review, because I found myself thinking about her ideas more and more. Any chance that you’d be willing to give my readers a brief taste of what you’re working on or thinking about?